It is not often that people would give DJs serious attention as long as the music is playing. However, it is different with DJ Nathan Tunes. He is easy on the eye. When he is behind the decks patrons on the dance floor go wild. When you meet him for the first time you get the impression he is one of the shy guys around but is familiar to music and fun lovers. Malawians may know him as Tay Grin’s official DJ. He is also a musician in his own right having produced the single Gwetsa which features his wife Hazel Mak. This is the song that also won him the UMP music video of the year 2018. “People know me as a DJ and it means the world to me. I crafted myself to be this kind of DJ for the longest of time. I want to show the youth or upcoming DJ/artist that we cannot all be doctors or lawyers. I want to urge parents to nurture their children talents always,” says Nathan. So how did the shy guy end up being on the turntables a DJ? “When my dad passed away in 2006 in Malawi while I was in UK, I stopped working. I was confused and emotional. 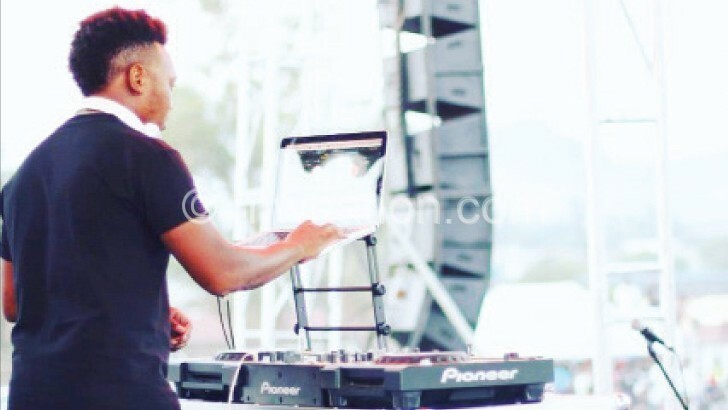 It was during this difficult time that I found a way to relieve my stress and it was through music,” said DJ Nathan Tunes, real name Nathaniel Dumisani Mwale. While in the UK, Nathan went to a wedding in Nottingham where his friend and DJ Alex Mbegan Kachingwe left him to look after music equipment as he went to freshen up. “So, I was looking after the equipment when the bride and groom arrived, but there was no music. Somebody screamed at me to start the music. I tried to explain that I was not, but the guy emphatically said I was the DJ from that moment,” he said. Nathan had no choice but to take the CD bag and chose some CDs. “Within five minutes I had figured out the machine and started playing music. I played like a professional and when Alex came back I was busy mixing and fixing music. He refused to take over and that is how my journey as a DJ started,” added Nathan. Nathan then joined a music school called School of Sound Recording College (SSRC) in Manchester while pursuing a marketing course at the same time. By 2007, Nathan was in clubs making people dance all over United Kingdom. In fact, for two consecutive times Nathan was the head Deejay for the biggest club in Manchester. DJ Nathan, who is married to R‘n’B star Hazel Mak, said when it comes to private and professional life, he knows the balance too well. “We are both artists. We are focused and have the same goals. We encourage each other to push boundaries. We respect each other’s brands and as you know it’s never easy, but we signed up for it. I think it is safe to say we both married music first,” says Nathan. His long-time music companion Tay Grin speaks highly of their working relationship. The two artists were introduced to each other by DJ Kenoree who is now based in the USA but had worked with Nathan at Basement club before his departure. “Before he left Malawi DJ Kenoree recommended that I work with Nathan. I had seen them work together on several occasions and I was impressed,” said Tay Grin. Nathan says working with Tay Grin has created the ‘baddest’ combination! “The energy and passion we have for music is levels up. That’s why we are a team. I am his official DJ and the saying goes, ‘there is no MC without a DJ, every artist needs one,” he recounts. Currently DJ Nathan Tunes is finalising a debut Extended Playlist. He is also a member of a music group called The Classmates which recently released a single titled Dreams and Wells. He was born in Blantyre and is fifth in a family of 8. He did his primary schools at Namiwawa then went to Joyce Banda Foundation for two years before finishing his high school at J Charles High. Soon after finishing high school he travelled to the United Kingdom where he joined a marketing company called Cobra Group.